A band called Maple Leaf decides to take a trip to the Gemini House, a famous lodge in a ski resort in the Japanese mountains. There they find the quiet and calm to think about their newest work and how to advance their next shows. It was supposed to become a time of leisure, but it was turned into something different, when one evening one of their members vanishes from the grounds and is nowhere to be found. Later a corpse will be found in a perfect locked room at the end of a long hallway, the rooms all numbered with greek numerals. How did it get there, why didn’t they find it before and what does that mean for the group itself. The group of friends is overcome by suspicion. Might a murderer hide in their midst or has an enemy from the past found them and is planning his revenge against them? Who can they trust in a murder play where everything is hidden behind a curtain of doubt and where corpses wander about in the night? Sounds like an interesting read, doesn’t it? Yes, I thought the same when I started reading it, but sadly it became a terrible drag to read as it went on. My biggest problem with Utano’s debut-work was for me that he created this very interesting mystery about vanishing/moving corpses and impossible crimes, but the actual story was just boring. I never once started caring for the characters and didn’t really feel any tension, except for two moments, one being when they searched the Gemini House and the other when the blackout happened in the club. At least 70% of the book deals with one trick and how it was executed. That’s good and all, but if I don’t really care for the case to be solved it’s hard to keep being interested. I have to admit, the trick was something new, but I found it a bit farfetched to actually believe it. There were so many things that depended not on genius but on pure luck and people’s stupidity, I found it hard to actually praise the trick. I know, it often happens that impossible crime’s only succeed through the incompetence of the people observing them, that’s the trick, but this time it crossed that thin line into the “How the heck did they NOT notice it” area, for me at least. Shimada Kiyoshi praised the trick as being ingenious, I don’t know what he smoked on that day or if he doesn’t like his own tricks, but I can’t really agree even though, of course, it was a trick that I hadn’t seen before. Yeah, I know it sounds like this was the worst book I’ve ever read and honestly, considering it took up half of my holiday season I’m actually a bit pissed. But if you’re searching for a novel that really concentrates on the construction of a trick and doesn’t bother much with character backgrounds, long expositions or any form of sidetracking than this is probably the novel for you. It’s a well constructed mystery, but not a well constructed story. 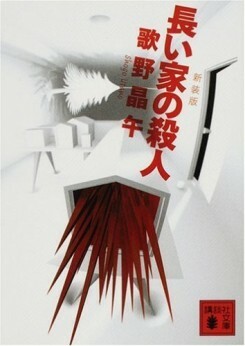 It was a bit like the 殺意 short stories by Tsukatô, only that it didn’t span 50-100 but 400 pages. I myself am not that amazed, but anyone who knows what I’m normally enjoying about novels should understand. ~ by seizonsha on 2011/01/08. I’m a reader who actually is more interested in the construction of tricks in detectives (and I actually care very little for the whydunnit), but it can indeed be quite vexing when something that should have been a short story, is made into a novel-length story. I therefore usually prefer detective short stories, from “normal” 50-100 pages long short stories to minimalist 5-10 page stories (i.e. Ellery Queen’s “Puzzle Club” stories). If that’s the case you would probably like Tsukato Hajime’s (柄刀一) 殺意-series. So far I only read 殺意は砂糖の右側に, though I still haven’t had the time to actually write a review. The stories are mostly short cases of 30-50 pages, connected by the detective characters. Some of the cases I found quite intriguing and it’s at least good entertainment when there’s not enough time to read a whole novel. The mysteries are quite well done, even though it’s still a mixed bag of believable and unbelievable tricks. It’s not like a lengthy whydunnit has to be in a story for me, but in 長い家 the reason was more like a 90’s crime-drama and nothing particularly interesting. Like you said, this novel feels like it was planned as a short story but ended up becoming too long. But I think I’d be willing to give one of his later works a try to see if he was able to grow regarding this flaw or if it’s just his style.